Man is not himself only. ...He is all that he sees; all that flows to him from a thousand sources, half noted, or noted not at all except by some sense that lies too deep for naming. He is the land, the lift of its mountain lines, the reach of its valleys; his is the rhythm of its seasonal processions, the involution and variation of its vegetal patterns. Psychologist Peter Kahn coined the term environmental generational amnesia to describe the narrative construct formed by each generation during childhood around what's environmentally normal. Kahn argues that each generation's experience of the natural world becomes successively mediated and augmented by technology — much to the detriment of our mental and physical well-being (cf. Technological Nature: Adaptation and the Future of Human Life). Outdoor Reveries, published in 1920, is a compilation of pleasant thoughts and daydreams in the form of meditative poems by father E. Parker Jaques accompanied by illustrations made by his son Francis Lee Jaques. The elder Jaques' poems are interspersed with his progeny's exquisite illustrations of the natural world encountered. Outdoor Reveries exemplifies the sensual grace of first-hand experience, observation, and reflection. The poems and illustrations are inspired by an immediacy with nature. The Jaqueses' poems and illustrations remind us of the time and space necessary to observe and absorb nature with sensual acuity. 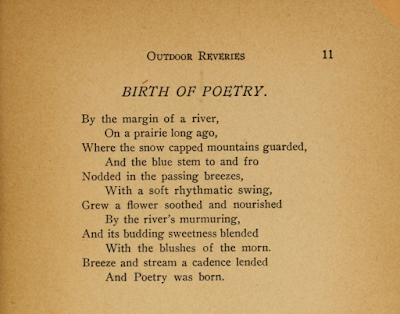 In the opening poem, Birth of Poetry, E. Parker Jaques writes of the rhythm of nature in the wind. Jaques has the time and inclination to watch prairie blue stem grasses bending to and fro from the passing breezes. Indeed the elder Jaques muses that the poem itself must have been born by the margin of a river. A direct and abiding connection with the natural world characterizes the experiences of many our of forebears a few generations past. The natural world effected many in profound and visceral ways. Nature has long been a wellspring of well-being. "As we build bigger cities, we're not aware how much and how fast we're undermining our connection to nature, and more wild nature—the wellspring of our existence." As we are drawn to population centers, it becomes critical for urban dwellers to escape their anthropogenic cocoons to experience the natural world in reverie. "Only spread a fern-frond over a man's head and worldly cares are cast out, and freedom and beauty and peace come in." Beyond Borders: The Selected Essays of Mary Austin, Mary Austin Hunter. Environmental, generational amnesia, sound recording of Peter H. Kahn, The Natural Histories Project. Finding connections to nature in cities is key to healthy urban living, Michelle Ma, Phys.org, 3 June 2016. Outdoor Reveries, E. Parker Jaques and Francis Lee Jaques, 1920. Technological Nature: Adaptation and the Future of Human Life, Peter H. Kahn, MIT Press, February 2011.